Summertime spells summer fun. And for bargain hunters nothing is more fun than sidewalk sale days. Recently the Markdown Chics attended Grand Days in St. Paul, Minnesota. This is an annual event that takes place around the first weekend in June and is a great opportunity to explore sites that are close by, in fact, in your own neighborhood! Families, couples, and friends of all ages and their pets walked the 3-mile stretch between Cleveland Avenue and Dale Street on Grand Avenue in St. Paul, Minnesota’s highland park district for Grand Old Day–the largest one-day festival in the Midwest. The event started at 7:45am and ended around 5:00pm. 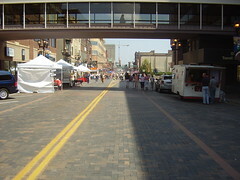 Over 150 food and merchandise vendors and several entertainment venues lined the streets. Some of the highlight’s from this year’s event included several musicians such as a couple of didgeridoo players, a fiddler, a mariachi and a rock band. Several food vendors that frequent the state fair were also there such as mini-doughnuts, corn dogs and brauts, gyros and other ethnic foods, ice cream and smoothies. And many artists were selling tie-dye shirts, jewelry, hand-carved furniture and masks. This event happens only one-day during summer, so mark your calendars for next year! The smell of mini-donuts intermingled with szchuan, the virtuosity of an accordian player heard in the distant block, and coupled with the footsteps and the rattle of shopping bags as bargain hunters crisscross the blocked off streets. A bargain hunt that assails your senses plus provides entertainment and sightseeing. 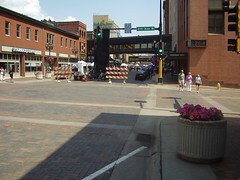 This is the fun atmosphere that shoppers experience during annual sidewalk sale days or downtown days. Such events afford opportunities to find upcoming Christmas gifts, birthday gifts and summer clothing bargains. Merchants are eager to turn over their stock and markdowns can run from 15-75% off. Larger stores will also ship in merchandise from other sites to woo buyers to their tables. In some communities sidewalk sale days are followed by parades and street dances, making it an event with something for everyone. Take a stroll, taste the offerings of your favorite restaurants, enjoy the music and free entertainment of sidewalk sale days–as American as apple pie and coffee. Click Here to View Sidewalk Sale Days Slideshow!